بهزادی شهربابک, محمدجواد. (1397). مروری بر عوامل عفونی سقط جنین گوسفند و بز در ایران. تازه ها در میکروب شناسی دامپزشکی, 2(2), 26-37. محمدجواد بهزادی شهربابک. "مروری بر عوامل عفونی سقط جنین گوسفند و بز در ایران". تازه ها در میکروب شناسی دامپزشکی, 2, 2, 1397, 26-37. بهزادی شهربابک, محمدجواد. (1397). 'مروری بر عوامل عفونی سقط جنین گوسفند و بز در ایران', تازه ها در میکروب شناسی دامپزشکی, 2(2), pp. 26-37. بهزادی شهربابک, محمدجواد. مروری بر عوامل عفونی سقط جنین گوسفند و بز در ایران. تازه ها در میکروب شناسی دامپزشکی, 1397; 2(2): 26-37. Abortion is one of the problems of sheep and goats breeders in Iran and imposes significant economic losses on farmers. Infectious agents are the most common reason for abortion in sheep and goats. Some of these agents, such as Brucella and Toxoplasma, Leading to zoonotic diseases. Regarding the important role of sheep and goat breeding in livelihood of the people, it is very important in terms of economics and public health, to accurately know the abortive infectious agents in sheep and goat flocks. The purpose of this study was to investigate all the literature which attempts to diagnose Bacterial, viral and protozoan agents of sheep and goat abortion in Iran. 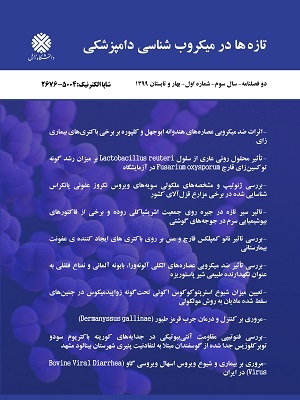 Therefore, all articles related to abortion of sheep and goats, individual infectious agents and their prevalence in the geographical area of Iran or neighboring countries, were included in databases including Science Direct, Pub Med, Scopus, Google scholar , Magiran and Iran doc were searched. Of the English and Persian studies found, 36 studies were conducted on abortion of sheep and goats that their results inserted in a table for better evaluation. Based on studies that examined the causes of abortion of sheep and goats in different provinces of Iran, Brucella, Toxoplasma, Chlamydophila, Campylobacter and Salmonella are the most common causes of abortion in the country. No study has tracked the viral agents in abortion of sheep and goats in Iran.